The time was October 1989. The Dalai Lama had just won the Nobel Peace Prize and Bette Davis, the First Lady of American Cinema had died at the age of 81. As significant as those events seemed at the time, some may say they paled in comparison to the events that were unfolding in a sleepy little part of Georgia, affectionately known to many simply as “FLETC”. The Federal Law Enforcement Training Center (FLETC), located in Brunswick, Georgia, has a long and colorful history as a training center for federal law enforcement organizations. It was during this time that a training course was developed to train students how to seize, examine, and extract evidence from computers that had been used in the facilitation or commission of a crime. Although this cutting-edge course was originally dubbed “Computer Investigative Specialist” training, the name was later changed to “Seized Computer and Evidence Recovery” otherwise known as SCER. Development and presentation of the SCER course was truly a collaborative effort involving federal, state, and municipal law enforcement expertise, as well as highly-respected members of the software community. The core development and training cadre consisted of Mike Anderson, Chuck Rehling, Jerry Pierce, Chuck Taylor, Robert Kelso, Mark Rouche and Tom Waters of the Canadian Tax and Revenue Service, Vancouver, British Colombia. Destined not only to become a standard for computer forensic training, but to influence the future of computer forensics, the first class consisted of 21 students, from which some of the first members of the IACIS Board of Directors would emerge. On October 23, 1989, the International Association of Computer Investigative Specialists (IACIS) was created. On this auspicious day in history, twenty like-minded law enforcement professionals assembled to hammer out the framework that was destined to become arguably one of the most influential computer forensic organizations in the world. Although that initial meeting lasted less than two hours, the organization’s name, objective/goals, manner of incorporation, organizational structure, director terms, means of selecting directors, authority and responsibilities of directors, membership type and qualification, conditions of membership status, and membership dues were all decided in a meeting that lasted less than two hours! One of the key issues being decided during that meeting was what to call this new fledgling organization. Ultimately, the choice fell between the International Association of Computer Investigative Specialists (IACIS) and the International Fraternity of Computer Investigative Specialists (IFCIS), with IACIS winning out by a 13 to 7 vote. It was also decided that membership in IACIS would be open to sworn law enforcement personnel that had successfully completed the SCER training. Membership dues were set at an annual fee of $50, commencing on January 1, 1990. Once established, the new Directors were charged with responsibility to pursue non-profit status through the development and adoption of Articles of Incorporation and organizational by-laws. Additionally the Directors accepted responsibility for developing guidelines for the seizure and processing of computer evidence, creating organizational logos, business cards, and letterhead, and for forming committees to administrate newsletter, membership, and organizational security issues. Later the following year, on April 6, 1990, IACIS was incorporated as a Not-for-Profit Organization in Oregon, with Thomas Siepert of Portland designated at the initial registered agent. The original mailing address of the IACIS was PO Box 2370, Portland, OR 97208. IACIS was later granted 501(c)(3) status by the US Internal Revenue Service. In February 1991, IACIS held its first training class at the Red Lion Hotel located in Portland, Oregon. Some of the topical courses taught during this first training event included: preparing search warrants, undeleting files, file compression, and ethical use of software. It is interesting to note that many years later, these foundational courses are still an integral part of the IACIS training curriculum being taught today. Subsequent training classes were held in Portland, Oregon during 1991, 1992, 1993, and 1995. A special training course was offered for the US Army in 1992, while another was held in McLean VA in 1994. In 1995, a training course was taught in Hong Kong, marking the first time the course was hosted overseas. In 1996, IACIS moved its annual training event to the Orlando, Florida area, where it has remained to this day. As the popularity of the specialized forensic training and corresponding membership in the organization continued to grow, the reputation of the organization spread internationally. In 2006, IACIS entered into a training partnership with organizations within the European Union to provide basic and specialized computer forensic training to the European Union law enforcement community. The training was hosted in Germany through 2012, when the contract ended. In 2013, IACIS entered into a similar partnership to continue providing computer forensic training to members of the European Union law enforcement community, but the training was moved to Croatia where it is currently being held. As a testimony to its international focus, IACIS has also previously provided computer forensic training in Australia and most recently in New Zealand. From its very inception, IACIS was built upon two foundational pillars – training and certification. Aside from training and foundational to its core purpose, IACIS has been instrumental in the development and implementation of a carefully constructed certification process for its membership. In those earlier days, those successfully completing the IACIS training were granted the DOS Seizure Certificate (DSC) and offered the opportunity to complete an additional set of post-training problems and testing. Those successfully completing the problem set and rigorous testing were granted the DOS Processing Certificate (DPC). The first member of record to obtain the DPC was Dean Chatfield, who coincidentally is credited with the idea of IACIS members “coaching” IACIS students. Mike Anderson was the first Director to oversee IACIS certification and is also the likely source of the now common term “Computer Forensics.” The DOS Processing Certificate became the impetus for the highly coveted Certified Forensic Computer Examiner (CFCE), established in 1999. Over its vibrant and colorful history, IACIS has emerged as a premiere international organization specializing in training and certification in the field of computer forensics. 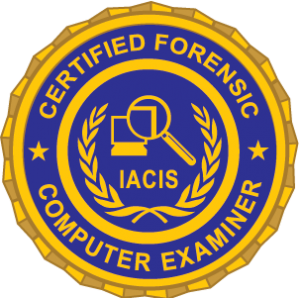 As a testimony to its continual pursuit of excellence in the scientific discipline of computer forensics, in 2012 IACIS was accredited by the Forensic Specialties Accreditation Board (FSAB) and is recognized as the first computer forensics organization accredited for its certification program (CFCE). Later that same year IACIS began offering certification as a part of the Certified Advanced Windows Forensic Examiner’s program. Today IACIS is governed by an 11-person Board of Directors and consists of approximately 2,200 members and 1,800 CFCE’s located around the world.